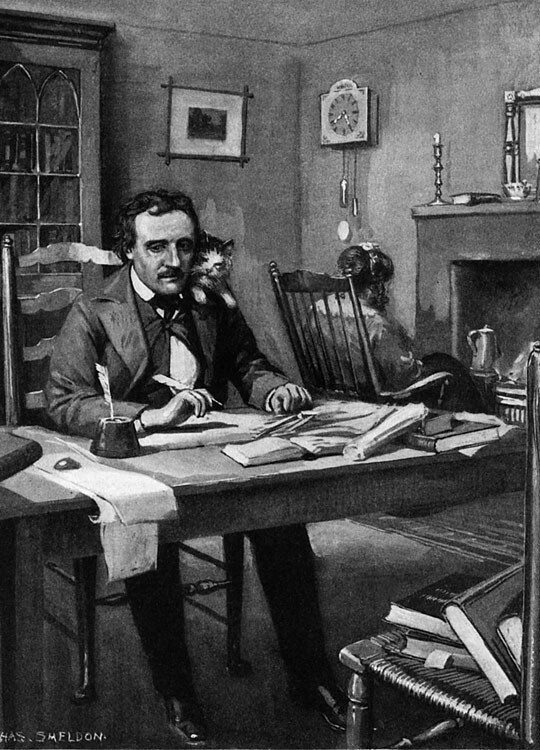 This drawing, depicting Poe with his cat (Catterina) and his wife (in front of the fireplace) is by Chas. Sheldon. It was used, among other things, to illustrate a book cover for The Complete Works of Edgar Allan Poe, published by T.Y. Crowell & Co. (in 1902). By all accounts, Poe and Virginia adored each other. He taught her algebra; she sang to him. They played games together; he tried to support a three-person family. Finances were a constant struggle. Even Maria Clemm - the third member of Poe's household - tried to find work. Beyond his life as a critic, Poe was writing fiction. He launched the detective-story genre when he wrote The Murders in the Rue Morgue (featuring mystery-solver C. Auguste Dupin). It was published, in Graham's Magazine, during 1841. Then ... the blood of Poe's fiction began to mix with the blood of Poe's real life. One day in 1842, while Virginia was singing and playing her piano, she coughed-up blood. In light of what he'd been through with his mother - and with Fanny Allan - Poe must have instantly worried about "consumption." Virginia did, in fact, have tuberculosis. Her symptoms varied widely. Sometimes she was wretchedly ill; other times she seemed unaffected. For Poe, who watched his wife struggle for five years, the sorrow must have been overwhelming. Writing at home, where his wife was dying, Poe knew that one day he would lose her, too. We can sense the looming loss in some of his works - like "The Raven." Bos, Carole "POE and HIS WRITINGS" AwesomeStories.com. May 01, 2012. Apr 20, 2019.
Who Wrote the First Detective Novel?